Chaz Davies will not need another operation following his second training accident of the summer, while doing supermoto in Aragon last Thursday. 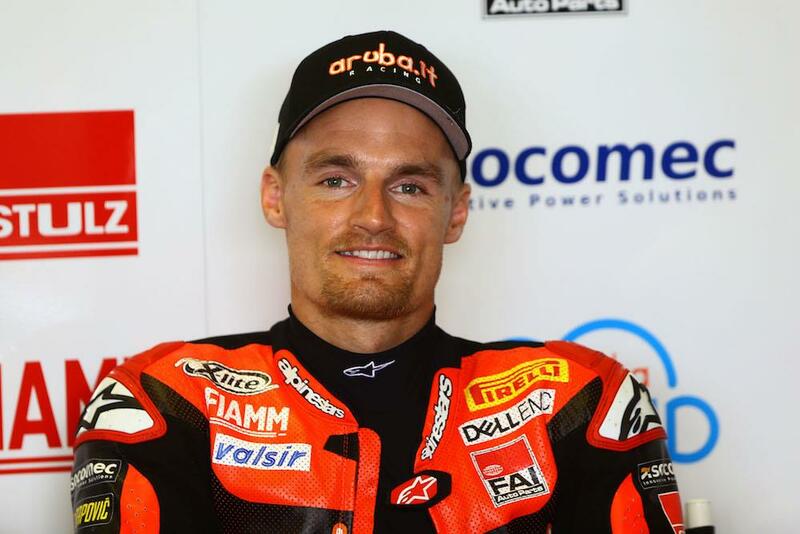 Initially there was concern that the Aruba Ducati World Superbike rider would need another operation to treat a broken right collarbone, which had already been broken in July when a subsequent operation involved a plate and eight screws being attached. Going under the knife again would have posed a major threat to Davies competing in the Portuguese Round of the championship in two weekends’ time. The Aruba team has confirmed that Davies crashed alone and that no other rider was involved. The Welshman has spoken today with renowned MotoGP and World Superbike doctor Xavier Mir in Barcelona with regards to what to do next. When questioned by MCN on Monday, the team confirmed that the plate inserted in July has been damaged ‘to some extent’ in the latest accident but the spokesperson stressed that further surgery will not be necessary as on this occasion Davies has not sustained a full break of the collarbone as he did in July. Davies trails championship leader Jonathan Rea by 92 points. A maximum 200 points remain over the final eight races in Portugal, France, Argentina and Qatar. Whatever happens Rea cannot claim a fourth world title at Portimao although, depending on results there, he could go on to wrap it up again at Magny-Cours.